Distribution and habitat: Euphorbia pulcherrima is indigenous to Mexico and Central America. It is found in the wild in deciduous tropical forest at moderate elevations from southern Sinaloa down the entire Pacific coast of Mexico to Chiapas and Guatemala. It is also found in the interior in the hot, seasonally dry forests of Guerrero, Oaxaca and Chiapas. Reports of Euphorbia pulcherrima growing in the wild in Nicaragua and Costa Rica have yet to be confirmed by botanists. Euphorbia pulcherrima is a shrub or small tree, typically reaching a height of 0.6 to 4m (2-16 feet). Description: Euphorbia pulcherrima is particularly well known for its red and green foliage and is widely used in Christmas floral displays. Growers in Scandinavia and California developed the strains that have been scaled down for use indoors. All Euphorbia pulcherrima are winter flowering shrubs notable for their coloured bracts. Modern forms are often no taller that 30-45cm (12-18 inch) with lobed or fiddle-shaped leaves that are 10-15cm (4-6 inch) long, toothed and coloured deep green etched with paler vein marking. The greenish-yellow flowers are insignificant, but each cluster of tiny flowers is surrounded by 10 to 20 actively coloured bracts, which look like narrowly pointed (or roughly heart-shaped) broad leaves. In the most showy forms, these leaf-like bracts are 20-25cm (8-10 inch) long. The colored bracts are most often flaming red but can be red, pale green, cream, pink, white or marbled. All Euphorbia pulcherrima are short-day plants, flower-bud and bract formation can be initiated only by an eight-week period of no more that 10 hours of light and no less than 14 hours of total, uninterrupted darkness per day. In addition, the plants are treated with a dwarfing chemical that effectively reduces stem length. 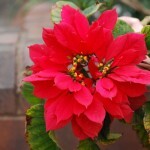 The resultant short-stemmed plants crowned by large and handsome bracts are normally sold when they are in full bloom in early winter, but they may also be timed for Christmas. Houseplant care: Under favorable conditions, the bracts will remain attractive for two months or even longer. Thereafter, most people discard the plant, but it is possible (through not particularly easy) to keep and bring them into flower again in the following season. Light: Keep Euphorbia pulcherrima in bright filtered light – full sunlight filtered through a translucent blind or curtain. Temperature: Cool room temperature is suitable for Euphorbia pulcherrima. Daytime temperature should be between 13-18°C (55-65°F), with a minimum at night of 10°C (50°F). High temperatures will shorten the life of the colorful bracts. Avoid temperature fluctuations and warm or cold drafts. Place the Euphorbia pulcherrima in a drought-free position by keeping the pots plunged in containers of moist peat. Do not expose the plant to gas fumes. Water: Water the plant carefully, allowing the soil almost to dry out between waterings. Use the leaves as an indicator and water well as soon as any sign of wilting is observed. When is time to water the plant, the potting mixture should then be thoroughly saturated. Fertilising: No feeding is necessary. Keeping the plant for another season: After the bracts have faded and fallen, cut top growth down to 3-5cm (1-2 inch) from the base and allow the potting mixture to become almost – but never completely – dry. When growth stops, keep the dormant plant at normal room temperature, in bright filtered light, until middle of the spring; then flood it with water. The plant, still in its old pot, will soon begin to grow again. The stump of the old plant can be allowed to develop an entirely new season’s growth. Repot the newly growing plant in a fresh soil-based mixture after shaking off the old potting mixture. Do not use a larger pot than the original one for a newly growing old plant. Bigger pots merely encourage the rapid growth of lush foliage at the expense of the flowers and bracts; the result is likely to be a huge plant which is unrecognisable as a Euphorbia pulcherrima. Once reported, treat the restarted old plant as a newly purchased plant, except that it should be given monthly application of a standard liquid fertiliser, until middle-autumn. Thereafter to stimulate flowering it is vital to subject plants to a strict regimen of short-day for the next 8 weeks: Give the plant no less than 14 hours of darkness per day – cover them with a black plastic bag from early evening for about 14 hours. During the day plants need to receive bright light, recommended natural daylight. 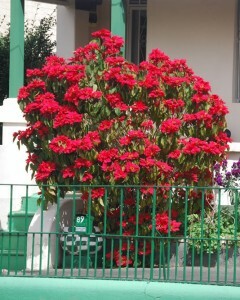 The resulting plants are usually taller than commercially produced Euphorbia pulcherrima. The dwarfing chemical used by professional growers is rarely available for use by amateurs. Propagation: Euphorbia pulcherrima can be propagated by cuttings from the tips of the new growth, taken in summer. Taken 12-15cm (5-6 inch) long cuttings from the new side shoots and root them to make new plants. The end cut should be treated with water to seal in the latex and they should then be inserted in small pots containing a mixture of equal parts of peat moss and coarse sand. Keep the pots at room temperature in filtered sunlight and water only enough to make the mixture barely moist. Allow the top two-thirds to dry out between waterings. When rooting has occurred (normally in three or four weeks) and the cuttings are growing actively, move them into pots of fresh soil-based potting mixture and treat them as mature Euphorbia pulcherrima (see Keeping the plant for another season section after repotting). Culture: When grown outdoors, Euphorbia pulcherrima grow best in full sun through to about half shade. They need to be placed where they do not receive a spillover of night light from a street or house window, as flowering is stimulated by shortening of the daylight hours. They like rich, well-drained soil and need protection from frost and strong winds. They can be pruned after flowering in spring to encourage a more compact shrub. Problems: Euphorbia pulcherrima is generally problem free if given enough light and not overwatered. Loss of flower heads and browning of the leaf edges indicate insufficient humidity. Treatment: Correct the humidity by misting the plant regularly. Uses: Euphorbia pulcherrima is widely cultivated as a garden ornamental in tropical and subtropical areas and grown commercially as a pot-plant, in particular for sale during the winter period. Euphorbia pulcherrima‘s brilliant red floral display held against rich green foliage has made this species a holiday favorite. 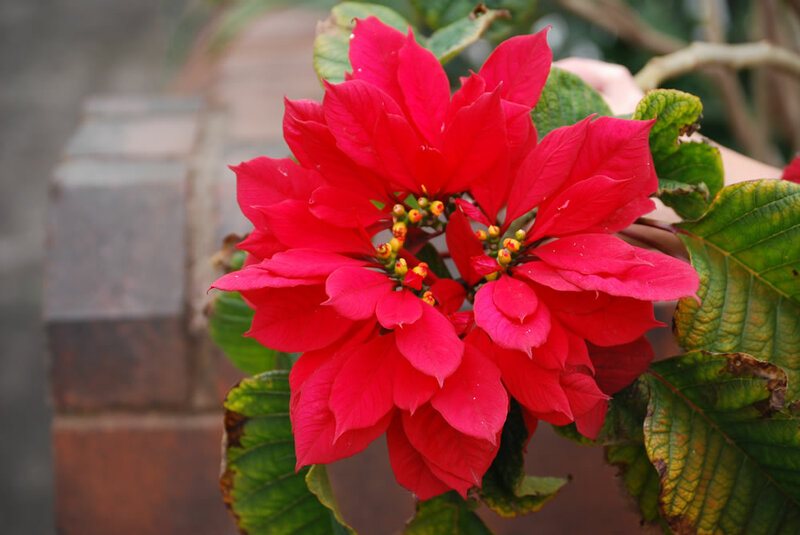 Its appealing presentation of the traditional Christmas colours has so endeared poinsettia that it is now second only to the Christmas tree as the most popular holiday plant. Euphorbia pulcherrima ‘Barbara Ecke Supreme’ is a much branching plant with very large cardinal red bracts closely surrounding the central flowers. Euphorbia pulcherrima ‘Mrs Paul Ecke’ is featured with fewer stems and blood red bracts. Euphorbia pulcherrima ‘Ecke’s White’ has long lasting creamy white bracts. Toxicity: Euphorbia pulcherrima‘s toxicity is relatively mild. Its latex can cause an allergic reaction in sensitive individuals. It is also mildly irritating to the skin or stomach and may sometimes cause diarrhea and vomiting if eaten. Sap introduced into the human eye may cause temporary blindness. Use gloves when handling Euphorbia pulcherrima to avoid any accidents.